High capacity channel drainage system in car park at McArthur Glen, Designer Outlets, York ..
McArthur Glen, the leasing, management and marketing company has twenty-one Designer Outlets in eight countries across Europe and is still expanding its business. The new Designer Outlets indoor mall at Fulford, York features over 120 designer brands including clothing, footwear, eyewear, homewares, restaurants and cafés. The mall is set in 60 acres of landscaped grounds, including an extensive free car park available for customers. 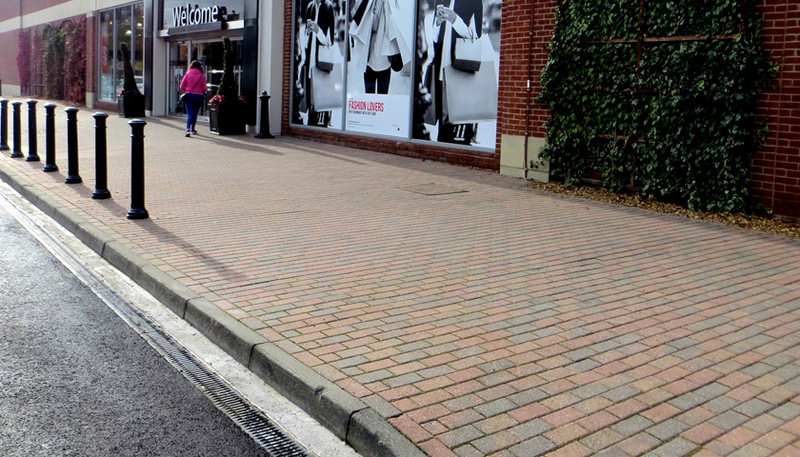 Hauraton Limited introduced the RECYFIX® MONOTEC, surface drainage system in January 2016.The McArthur Glen Designer Outlets mall, York, joins numerous installations successfully completed in the United Kingdom. The RECYFIX® MONOTEC system was installed to provide surface drainage in a section of the car park’s asphalt surface. Having a grating width of 100mm (Channel internal dimension) with an overall height of 230mm and a cross-section of 190.5cm2, the 66 metres of channel supplied provide a total water capacity of just over 1260 litres. The MONOTEC one metre long channel component is of a sturdy monolithic design where the HEELSAFE grating and the tongue and groove linking system are integral to the channel moulding. The whole unit is made of tough, virtually unbreakable polypropylene (PP) formulated to be very resistant to daily temperature fluctuations from frost conditions to strong sunlight, including the Ultra Violet (UV) spectrum. PP is naturally resistant to de-icing salt. Complying with the requirements of EN 1433, the PP is given its UV resistance by adding just sufficient stabiliser so that the structural strength of the material is unaffected and a consistent appearance is maintained. The MONOTEC channels have a loading category of up to Class D400. Tim Connolly, Hauraton‘s Managing Director comments; “The tongue and groove features on the MONOTEC channels provides easy assembly of the moulded components and facilitates the alignment of the channel run so cutting installation time for the groundwork contractor. All Hauraton surface water drainage systems’ comply with European Standards (hENs) and carries the CE mark”.